Burt has added a June 14, 2019, performance at the Lewis Family Playhouse in Rancho Cucamonga, California, to his tour schedule. As always, visit the On Tour page for the latest confirmed tour dates. 8 time Grammy Award winner and 3 time Academy Award winner, world renowned composer Burt Bacharach joins us for a one night only concert! As vocalist with the Walker Brothers, Scott Walker introduced UK audiences to “Make It Easy on Yourself,” which became a No. 1 hit in 1965. While his popularity diminished over time, his creative output never waned and he became a cult artist in the 90s and 00s with a series of challenging, increasingly abstract records. RIP Scott. Scott Walker, a singer-songwriter who became a 1960s pop sensation as the leader of the Walker Brothers, then turned toward dark and moody avant-garde compositions as a solo artist, died March 22 in London. He was 76. His record company, 4AD, announced the death but did not say precisely where or how he died. 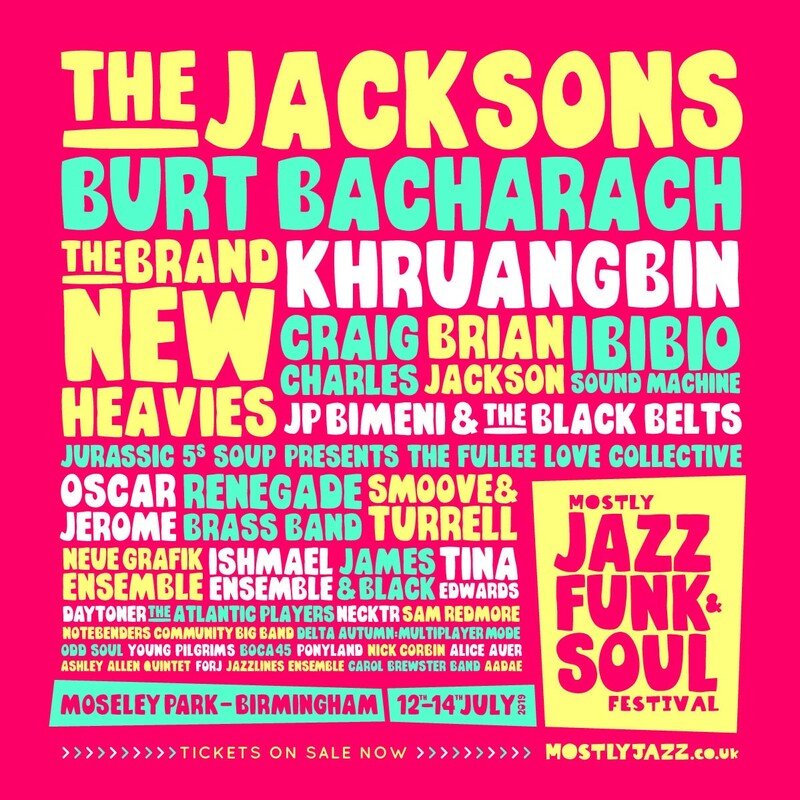 Burt Bacharach will be headlining the 10th anniversary of Mostly Jazz Funk & Soul Festival on Sunday, July 14, 2019. Mostly Jazz Funk & Soul Festival is set in the truly beautiful and unique setting of Moseley Park, Birmingham. Every year, the park plays host to a weekend of blistering live music, attracting people from all over the world who gather to see International legends alongside the latest contemporary breakthrough artists from the world of Jazz, Funk & Soul. This is a special year for the organisers as they gear up to celebrate the festival’s 10th anniversary in 2019. The team are promising their biggest programme of entertainment yet, encompassing even more music plus Dance Sessions, Artist Q&A’s, Music Workshops and more. Bacharach’s anecdotes added a lot of entertainment throughout the evening. As when he described working with Aretha Franklin on the song “Falling Out of Love,” and telling her “It’s in G major.” “No, it’s not,” she replied, informing him that the key needed to be changed (and you may be sure that it was). Tickets are now on sale for two upcoming shows in Germany. Burt will perform at the Elbphilharmonie Hamburg on July 7 and at the Philharmonie at the Gasteig in Munich on July 9. Click the link below for ticket info. Es war fast schon eine Schande, dass der Admiralspalast nicht rasend schnell und komplett ausverkauft war. Denn Burt Bacharach ist eine der größten lebenden Musiklegenden Amerikas. Trotzdem: hier gab es allein fürs Betreten der Bühne Standing Ovations! Der Abend verging wie im Flug und man kam aus dem Staunen kaum heraus ob der unendlich vielen Hits, die dieser Mann fabriziert hat. Burt Bacharach has added another date in Ireland to his summer 2019 tour schedule. Burt will headline the Galway International Arts Festival’s Heineken Big Top on July 22, 2019. Tickets now on sale..
Burt Bacharach to play Galway International Arts Festival’s Festival Heineken Big Top on 22 July 2019 as part of GIAF 2019 from 15-28 July. Just announced…Burt Bacharach will be appearing at the North Sea Jazz Festival in Rotterdam on Friday, July 12. Weekend tickets for this year’s festival are sold out, but single day tickets went on sale this morning. Another date has been announced for Burt Bacharach’s summer 2019 tour of the UK. Burt will kick off the Apollo Nights Summer Series, a new summer concert series at London’s Eventim Apollo (formerly the Hammersmith Apollo). 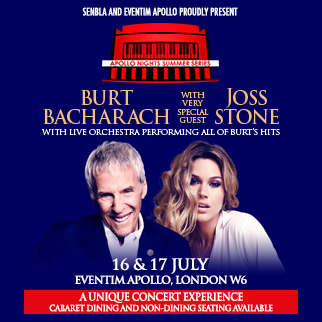 Burt will appear with Joss Stone backed by an orchestra on July 16 and 17. Pre-sale tickets for the performances will be available Jan. 30 via Ticketmaster. UPDATE: Tickets now available for Tuesday, July 16, and Wednesday, July 17. Other artists scheduled for this year’s Apollo Nights series include George Benson and Marc Almond. Just announced…Burt will perform in Glasgow, Scotland, on July 26 as part of this year’s Summer Nights at the Bandstand series in Kelvingrove Park. Tickets are now available via Ticketmaster. A House Is Not A Homepage is an unofficial website devoted to composer and performer Burt Bacharach.